Weddings are good for lots of interesting and oftentimes unfortunate circumstances. We’ve all heard stories of nuptials going awry, groom’s passing out, outbursts from the intending audience, rain and earthquakes reaching havoc on outdoor ceremonies; or, how about the one where the bride attacked the wedding band for taking a break? (You probably think we make that last one up, don’t you?) The fact is, with so many moving parts involved, there’s always a chance that a wedding ceremony or following reception can turn ugly in a hurry. 10) Has anyone seen the ring? A New Mexico man thought it would be a hoot to hide his girlfriend’s engagement ring at the bottom of her Frosty; so, the plan was put into motion and the ring was placed inside the cool creamy treat while the anxious beau looked on in anticipation. Coincidentally, the target of his ploy decided it was then that she’d engage in a Frosty eating contest with a friend who was also present. The two ladies sucked down their shakes, throwing caution to the wind and risking the inevitable brain-freeze that would result, until every tasty drop was consumed. The boyfriend, stunned that his fiancée hadn’t discovered the ring, went into a panic and tried to explain what just happened. It took a trip to the ER and an x-ray to prove to the Fast Frosty Finisher that she had in fact swallowed the diamond ring. We’ll leave the particulars about how they retrieved the jewelry to your imagination. At their rehearsal dinner, an Ohio couple dined on a tray of stone crabs at a restaurant where they first met. How romantic? The next day, the bride-to-be noticed she felt a bit uneasy in the tummy. Chalking it up to nervousness, an understandable explanation for her jumpy belly, the wedding proceeded as planned. 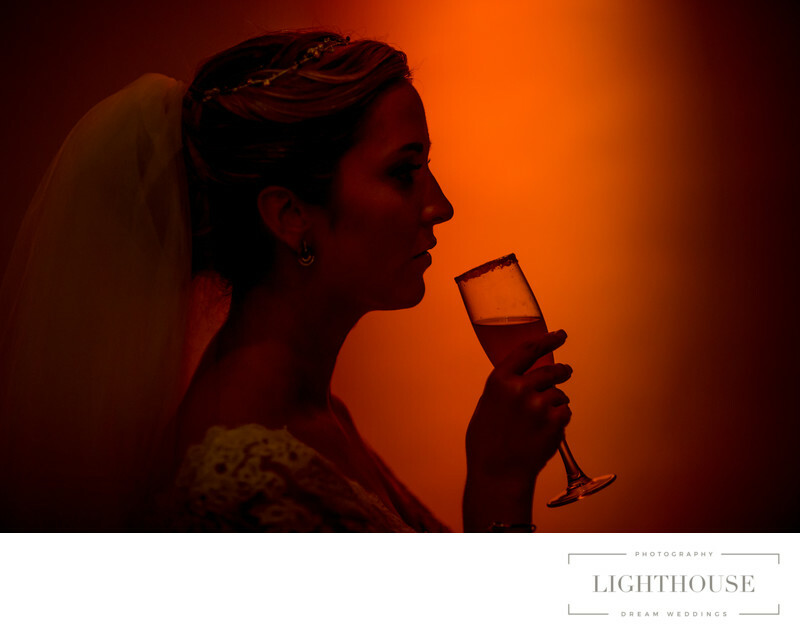 Sometime during the ceremony, the bride realized that what she felt was much more serious than a mere nervous stomach. Instead of butterflies, it was the stone crabs making her ill. Fearing she’d lose it before the gathered crowd, the vision in white placed her hand over her mouth to dam what she felt rising from below. Luckily, the priest officiating the ceremony noticed signs of the impending eruption, hurried the rest of the vows and such before sending the newlyweds back down the aisle toward privacy. Just as the two escaped from view, the dam broke…all over the bride’s gown. We hope a wardrobe change before the reception was already planned. 8) Wedding Singer? Check. Wedding Singer Security? Check. A New York Sate couple made it past the proposal and wedding ceremony without incident and were well on their way to a memorable evening of dancing and dining at the wedding reception. The entertainment, a local band experienced in playing weddings, decided they were going to take a short break while turning over musical duties to a DJ. Having none of this, the brand new bride lost her cool and stormed the stage. She knocked over expensive audio equipment and instruments in her rampage to the tune of over $1,500 in damage. When police arrived to settle the fracas, the bride and groom scuffled with officers until they were both arrested, cuffed, and on their way to the slammer. This wedding was a renewal of vows for the couple married 22 years. We assume the first wedding went off sans melee and multiple arrests which proves the adage; if it ain’t broke, don’t fix it. 7) Who Invited Karma to My Wedding?! A woman who was friend to the soon-to-be-bride was asked to be a bridesmaid. Simple enough, right? Well, a day before the bridesmaids were to be fitted for their gowns, the bride asked her friend if she could replace her with an old college chum who had suddenly become available. Putting her personal feelings aside, the dismissed former bridesmaid went along, thinking of the bride’s preference on her big day and not wanting to interfere with her precise wishes. After the ceremony, it was the newly installed bridesmaid’s turn to offer a toast to the bride and groom. When she stood to deliver her remarks, illness took over (or was it too much champagne?) The college buddy proceeded to barf all over the bride’s gown…and the wedding cake. We wouldn’t begrudge the replaced bridesmaid just a little bit of satisfaction. After the wedding, a couple and invited guests retired to their hotel rooms to sleep off the partying that ensued after a flawless ceremony and reception. One of the guests apparently enjoyed the open bar a little too much that night and stumbled across his hotel room to find the bathroom for a little middle-of-the-night relief. The swaying gentleman steadied himself before the urinal, aimed true, and began to empty his bladder. The next thing he knew, paramedics were checking his vital signs and treating him for electric shock. That urinal?…Yeah…that was his hotel room TV. He survived the jolt to his privates but it’ll be awhile before the “Must Pee TV” jokes subside, we’re guessing. 5) Quit Horsin’ Around…We’ve got a Wedding to attend. An English couple spared no expense in their wedding planning. One of the splurges included a horse-drawn carriage that was to deliver the bride and her father to the ceremony. The regal scene was abruptly interrupted when one of the horses pulling the carriage was startled and dashed off aimlessly across the lot. The explosive galloping threw the driver and assistant from the reigns leaving no one at the helm of the runaway carriage. The bride’s father sprung into action, tossing his daughter from the speeding buggy as it headed toward oncoming traffic. Though concussed and injured, the bride was okay but the wedding had to be postponed for six weeks while she recovered. Wild horses couldn’t keep her away. 4) Wish They Could See Us Now. A British couple planned their wedding to take place at a posh Dominican Republic resort. This of course meant that those who would attend would need to make arrangements for the trip across the pond to witness the event. Unfortunately, the Dominican Republic’s wedding waiting period was misunderstood by the planners, forcing the wedding to be conducted three days earlier than scheduled. Consequently, the entirety of the wedding party would not be present, leaving the bride and groom with no family or friends to see them commit their lives to each other. The other newlyweds on this list probably wish they could have had their debacles unfold without audience, but we feel sorry for the Brits who were married alone. Some wedding plans involve features or ceremonial aspects of the proceeding that signify a couple’s culture or family tradition. This was the case for an Illinois couple who planned their ceremony to include the lighting a single candle from the two smaller candles they’d each carry. This gesture was to symbolize their two lives being joined as one. Sometime during the various scriptures and other remarks offered by the minister, the groom’s candle flame had been blown out. A helpful assisted rushed the altar with lighter in hand, trying to reignite the groom’s candle. In his haste, the good samaritan stumbled on one of the pillows the couple used for kneeling, falling to his knees before letting out an agonizing groan. The bride, seeing the fallen helper in discomfort, bent forward to see if she could help the man to his feet. As she bent, her candle came dangerously close to her elaborately coiffed hair. The product in her mane was set ablaze, triggering gasps and commotion from the attendees but the bride was initially unaware of the flame. The groom began furiously patting her head, causing her to drop her candle on the train of her gown, setting it on fire as well. Both fires were put out before too much damage was caused but it turns out the man who rushed to help was an uninvited guest who crashed the wedding apparently after an afternoon at the local saloon. A Pennsylvania couple had an uneventful wedding rehearsal and the wedding went as planned. Then to the reception. Before the guests arrived, the hired DJ thought he’d do a little extra to make sure everything was perfect. Looking over the dull wood floor in the middle of the hall, the DJ decide that it needed a bit more shine so he waxed it. When guests arrived, the floor was a beautiful, rich, shiny, and SLIPPERY ice-skating rink. One of the bridesmaids immediately slipped and fell and the other guests were so unable to maintain their footing that everyone had to remove their shoes to even walk across the dance floor. We’re guessing the portion of the reception when everyone joined in “The Electric Slide” was pretty epic. This happens so often that we thought we’d combine them all into one spot. If you’ve never been to a wedding were someone faints, you’ve probably seen video footage on America’s Funniest Home Videos. The most common reason for passing out during a wedding ceremony has nothing to do with dehydration or a prior night of heavy drinking; the reason has to do with posture. When standing for an extended period of time people tend to “lock” their knees. This way of standing restricts circulation and causes the blood in your body to have a hard time reaching your brain – the organ that is responsible or balance and consciousness. When the blood flow is slowed for too long, down goes the groom. Place large and colorful bean-bags around the feet of the wedding party so if they forget to bend their knees slightly, the fall won’t result in a concussion or worse.